As we mentioned in Introduction Dub parking site is a content-driven one and one of the main ways through which the content is added is via RSS feeds. RSS feeds are a standard file format which websites can make available for other applications to consume and ingest the website's contents. Though it has been around for some time, it still is one of the easiest ways to consume contents via different tools of your choice, rather than having to visit that website. For this reason, many popular websites and blogs will offer their contents through RSS feeds and before you import contents via RSS feeds you will need to know the URL of these feeds. For each parking site, you can manage all the RSS feeds via the RSS Feed Manager as shown in screenshot 1. The RSS Feed Manager will give you a quick overview of all the feeds that you have added and provide information on how many contents were imported in total, number of pageviews it attracted and the last time it was crawled. Click on the New Feed button and you will see the popup shown in screenshot 2. In the Basic tab, you insert the RSS feed URL and also give it a name. In the Filters tab (shown in screenshot 3) you specify what contents of the given RSS feed can actually be imported. This is useful in a number of ways. For example, perhaps you want your parking site to focus on particular keywords, but RSS feed covers far too many topics. In addition to keyword-based filters, you also have a variety of filters you can apply to your contents. Filters are also handy in general when you want to control the quality of your contents. For some, it is fine to have any contents being imported to their parking site, as long as your parking site attracts users. However, for those users who wish to control what type of contents are available on your domain, though it may take a bit more time, filters provide you an excellent way of removing and adding only the ones that you want. You will also find the other tabs called Categorization and Tags. 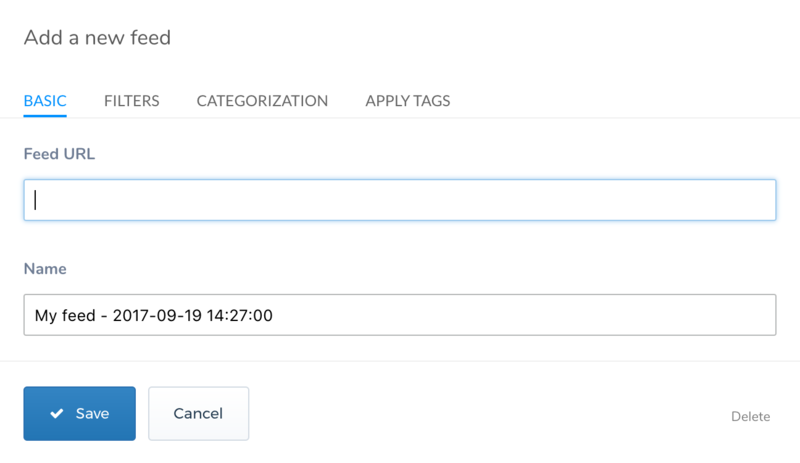 These are ways for you to automatically assign the given feed's contents to a category or tags that you wish. Updating an existing RSS feed works the same way as adding a new one. So click on an existing RSS feed and you will see a popup as shown in screenshot 1. Deleting an RSS feed will delete all the contents that were imported by that RSS feed and all the related data.